Getting close to when people who are working on the Four Seasons assignment (due December 28th) will be submitting their photos. Got the first submission from Debbie of the Lower Falls in Treman State Park near Ithaca, New York. What a difference. The falls look brittle in Winter, angry during the Spring thaw, calm in Summer and beautifully veiled in the Fall. Please, visit Debbie’s blog for her thoughts on this assignment. 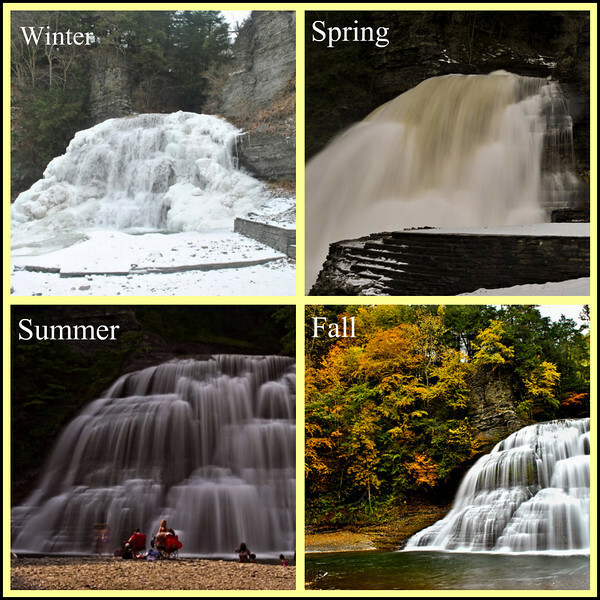 This entry was posted in Assignments and tagged autumn, fall, ithaca, new york, robert h treman, seasons, spring, state park, summer, water, waterfall, winter. Bookmark the permalink. What a great spot for the 4 seasons assignment! I know I took my pictures, now I’ll have to be searching through my archives to find them! Oh lovely and what a great assignment ! I love compilations like this. I never seem to find good spots to document such shots, but I guess interest is in the change not so much the location? But seeing this wishes I had a spot to shoot. Thanks for sharing, I will keep an eye out for more of these. Definitely a difference and what I love about the seasons of nature. And what a gorgeous waterfall that I would love to see in the frozen winter. It has been a long time since I’ve photographed the same scene during the four seasons. Great pictures! I really enjoying seeing the juxtaposition of the same spot in different seasons. Fall gets my vote for prettiest.